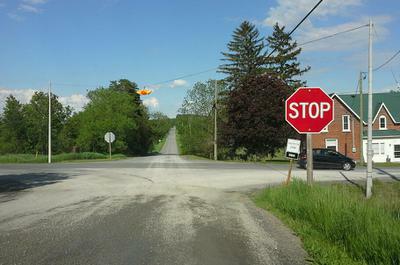 The intersection of Zion and Phillipston Roads. No buildings, cairns or plaques commemorate the WI in Bethel Zion ' s (Hastings District) small community north of Belleville, but two accomplishments we're proud of are that through lobbying and in partnership with the MTO and the City of Belleville, we have been successful in having a turning lane, signage and reflectors installed on Hwy 37 and Phillipston Road. And at a dangerous intersection in our neighbourhood we have had a flashing red light and a larger STOP sign installed. Both have significantly improved driver safety and are a daily recognition of our W I's presence and community involvement.